Exciting Gnews for Crafty Kids! Beginning June 23rd and every Tuesday throughout the summer, there will be a new, fun craft or recipe for kids! It could be anything from Seaweed Salad and Eyeballs to how to build a gnome home — you’ll just have to subscribe to the Winterfrost Craft Page to see! Hope that you join up, it’ll be fun! At the end of each book of both series– Phillip’s Quest and The Ragwort Chronicles, there are recipes. Part of this craft section will include some of the real live recipes from the gnomes, fairies and squirrels — maybe one or two from pirates, too! Hope you’ll enjoy the tasty treats!!! HAPPY NEW YEAR FROM WINTERFROST!!! Can I just tell you that the gang at Winterfrost is beyond ecstatic about the New Year! Edward celebrated on mulled acorn juice and, well … Anyways, he’s just waking up! There are so many new adventures that the village is eager to tell, and right now, everyone is talking at once. Oh, my head! But, I’ll let them all get a word in through Phillip and Dreamspinner. Phillip: Boots ‘n’britches! Another year in a gnome’s life is like ten in human years, so I feel happy and honored to be able to tell you my stories in Phillip’s Quest! That lovely lady, Belinda, is taking the most painstaking care to make sure that she tells about my quest, correctly. We wouldn’t want her to be struck down by a wizard! But..
Dreamspinner: Enough about you, Phillip, MY turn! So, we still are in Winterfrost where it’s terribly cold, but we are moving on with our quest — and yes, Miss Belinda is doing a splendid job! 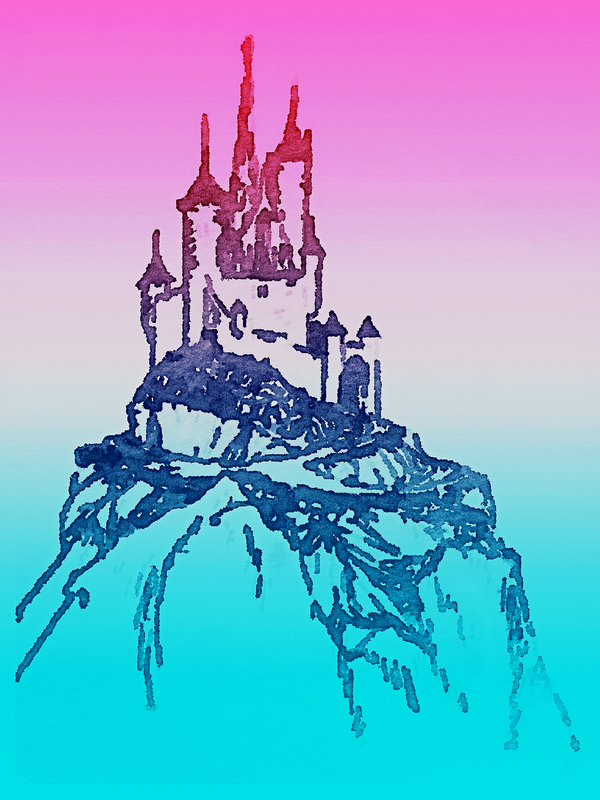 We still have a very long way to go until we find the castle but, we’ll find it! So many new friends to tell you about, so be sure to read the new book, “Above the Stars,” and thank you for letting us be part of 2014! Now onto 2015! Happy New Year! Oh. by the way, that’s Phillip and me going to Chaspere’s castle, above the stars! Thank you, Phillip, and Dreamspinner. The next book in the Phillip’s Quest series is “Across the Elusive Sea.” I am very please and proud to announce a new member of the Winterfrost team. She is my cousin, friend and the new illustrator for book three! Her name is Lorraine, and I know that you will love her artwork as much as I do! Welcome, and thank you, Lorraine! I have not forgotten about the Ragworts, either! While Rawlink is busy defending Twistedoak, his brother Roscoe, is on his way to the Diamond Mines. A very treacherous journey, indeed. Roscoe’s story will be published in June! The Ragwort Chronicles, Along the Way: Roscoe’s Journey. If I can get the fairies, gnomes, squirrels and pirates (did I say pirates?) to cooperate, am hoping to get a Tuber Family and Other Magical Creatures’ Cookbook out! But, in the meantime, if you would like the human consumption version of any of the recipes in the back of the books, let me know! Fill in the request form on the page at this website! Don’t forget that all books are out in ebook form! In January, Above the Stars is on SALE for $2.99 on Amazon, in ebook! Winter-time is reading time! Happy New Year! First official review by Jeff Botch of Friday Night Books on Tumbler! 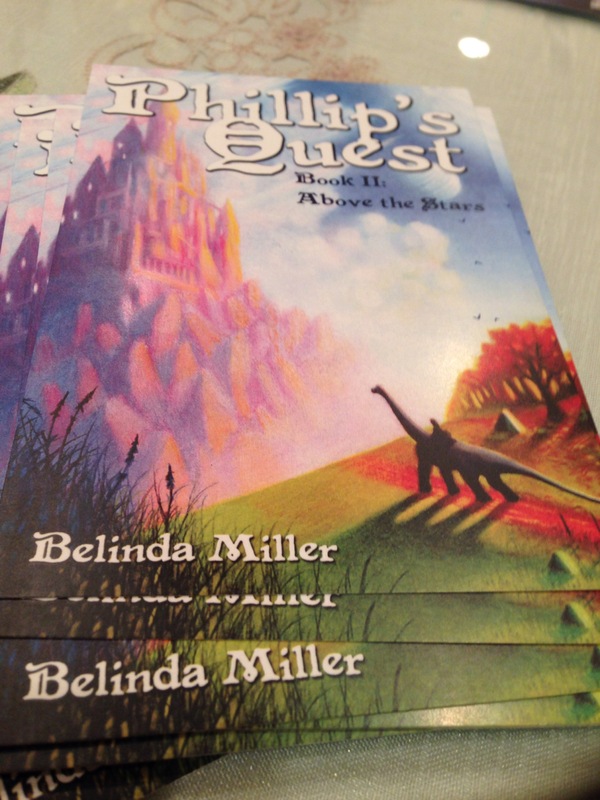 The second book in the Phillip’s Quest series was released Thursday, December 4th, 2014 and launched on Friday, Dec. 5th! As with Phillip’s Quest, Book I: Winterfrost, “Above the Stars,” is filled with beautiful, full-color illustrations, maps, and recipes! The characters begin to reveal their true personalities, and nature. This segment of the journey for Phillip, Edward, and Stinky is fraught with dangerous adventures in the land of Winterfrost, and new, unique characters. Phillip’sAbove the Stars Quest, Book II: Above the Stars is available on Amazon in softcover and ebook. Look for the ebook on sale, in January for $2.99. And no, Edward is not the editor! How squirrelly would that be! Actually Dreamspinner and I are the editors. She keeps me grounded. But, who is Dreamspinner? Ahhhh — the answer is in Phillip’s Quest, Book II: Above the Stars, available at Amazon and B&N, Dec. 1, 2014. Do you have a child whose drawings are good enough to be illustrations for a children’s book? Would you like them to be published in Phillip’s Quest, Book III: Across the Elusive Sea? Well, that is the GRAND PRIZE for 3 talented children in Phillip’s “Draw Stinky the Dinosaur” Contest! Contest starts 10/15/14 and runs through midnight 12/01/14! It is open for children in grades K-8. SECOND PRIZE: Signed soft copy of Phillip’s Quest, Book III: Across the Elusive Sea and ebook. Please use contact form at http://belindamiller.me to register your child’s name. All registrations must be completed by 11/15/2014. You will be contacted, upon registration with a submission address. Original drawings must be submitted and cannot be returned. They will become exclusive property of Winterfrost Publishing upon receipt. Those selected will be copyrighted upon publication. Winners will be notified prior to publication. A description of the dinosaur can be found in Phillip’s Quest, Book I: Winterfrost. Good luck everyone! Autumn in Twistedoak is, like many other places, a time for harvest and celebration. Besides being the most beautiful time of year, the gnomes celebrate the coming of the new season on the day that they have equal hours of day and night. During that time, the Equinox, they complete the gathering of their food, and do their canning and preserving of that food for the winter. This is all done in a communal setting. That is, the men of the village, up until age 300, get together and go from farm to farm to help with their neighbors’ harvest, while all the women meet in the square and set up a “kitchen” for doing the preserving. They work, all together, making sure that each and every resident of Twistedoak has enough food to get through the long winter months. As soon as the sun sets, samples of the food that was prepared, along with other goodies, that are contributed by all, are laid out on several long tables. There is also plenty of mead and beer–gnomes are great brewmasters! A huge bonfire is built and all the gnomes eat, drink and dance and sing until the sun comes up! Gnomes are workers. Besides being good farmers, they are the first “environmentalists.” Much of their day is spent on their farms, during the growing seasons, but when the season is over, they spend time in the forests, planting seeds and saplings that they care for, and grow to repopulate trees and as food for the animals. There are many gnomes, like Nonna Ragwort and Grandma Polli, who tend to injured animals that are brought to them. A gnome always helps a hurt or wounded animal. The gnomes are very careful about the materials they use. They do not waste anything. Before the snow arrives, the homes of Twistedoak are supplied with dried berries and nuts, firewood and pinecones. They make sure that they have enough to care for their family. The women are especially busy in the Fall. That is their time for weaving and sewing. They use the fur and hair shed and combed from various creatures to create the cloth they need. Autumn is the best time to collect the shed animal hair, as it is much softer before the animals grow in their thick, winter fur. Read about Phillip, in the land of Winterfrost, and his mission to save his brother, Phallow, and the village of Twistedoak from the onslaught of Razorsnoot and his goblin hoard! Book II, Above the Stars, tells of his adventure and the struggle of the Twistedoak gnomes to overcome the fight of their lives! Phillip’s Quest, Book II: Above the Stars will be available on ebook and in print on or before Dec.1, 2014. If you haven’t read Book I: Winterfrost, now is the time to read it! Winterfrost is available, now, in ebook! Phillip’s Quest, Book II: Above the Stars is available for pre-order, through this website. If you would like to receive a newsletter from Phillip and the gang, please complete the form on the sign-up page. Thank you.